India's Defense Minister Nirmala Sitharaman (L) speaks as U.S. Defense Secretary Jim Mattis looks on during a joint news conference in New Delhi, India Sept. 26, 2017. “This is, again, a historic opportunity for our two democracies, a time of strategic convergence,” Mattis said alongside his Indian counterpart, Defense Minister Nirmala Sitharaman. The U.S. sees India as a counterweight to the rising influence of China, and hopes to persuade New Delhi to become more involved in bringing stability to Afghanistan. “We applaud India’s invaluable contributions to Afghanistan, and welcome further efforts to promote Afghanistan’s democracy, stability, and security,” Mattis said. Pakistan, India’s longtime rival, opposes New Delhi’s expanded involvement in Afghanistan, fearing a future war with its strategic rival, (India), on two fronts. Sitharaman on Tuesday downplayed those concerns, pointing out that most of India’s support for Afghanistan has been non-military. “We have made it very clear that there shall not be boots from India on the ground,” Sitharaman said. India has invested billions of dollars in Afghanistan, mostly in sectors such as health, education and infrastructure. India also recently agreed to expand its support for Afghan defense forces, which includes training of Afghan army personnel. Mattis also found common ground with Sitharaman on what they say is Pakistan’s support for militant groups in Afghanistan. Sitharaman says she raised the issue directly with Mattis. “The very same forces which find safe haven in Pakistan have been the ones who have hit New York as much as Mumbai,” Sitharaman said. Mattis does not plan to visit Pakistan during his trip; but, U.S. officials deny that is meant as a slight to Islamabad. “The relationship we are building with India is not to the exclusion of other countries,” Mattis told reporters. U.S. Defense Secretary Jim Mattis inspects an honor guard in New Delhi, India, Sept. 26, 2017. Many in Pakistan are skeptical about burgeoning U.S. defense ties with India. The U.S.-India defense trade has expanded quickly. In 2008, such trade stood at roughly $1 billion. If current deals being negotiated were to go through, that could increase to around $19 billion. “I am confident that we are entering a new phase in our strategic defense partnership with the United States,” said Sitharaman. She added that both sides have agreed to explore “additional, specialized” military exercises. The U.S.- India partnership has taken on greater importance with China’s growing economic clout and increasing assertiveness with its neighbors in the South China Sea. “A peaceful and prosperous future in the Indo-Pacific region is based on a strong rules-based international order and a shared commitment to international law, peaceful resolution of disputes, and respect for territorial integrity,” he said. 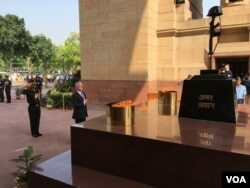 Mattis, who is making his first visit to India as Pentagon chief, also met with Prime Minister Narendra Modi and laid a wreath at a memorial to India’s World War I dead.